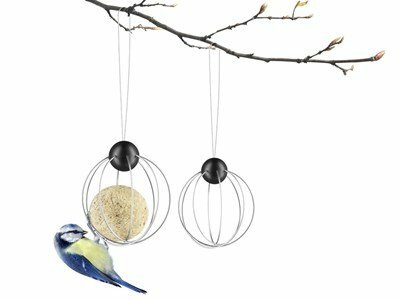 Suet bird feeder from Eva Solo, bird friendly! Therefore, a suet ball can be a blessing for our hungry feathered friends, who gather around the feeder to create a delightful sight from the window. Its new design makes it easier to hang in a garden or balcony... with a special flourishment! The suet bird feeder is designed to prevent the suet balls from falling out, and at the same time, it ensures that larger birds, for example pigeons and magpies, do not fly off with the suet ball. The suet bird feeder is sold in sets of two.